Doylo's blog: Ormesman of the Week: Rowland Edwards - Early Activist. Ormesman of the Week: Rowland Edwards - Early Activist. Climbers had begun to sample the climbing on the Ormes by the late 60s but the first man to fully appreciate the potential of the place and take the bull by the horns was Rowland Edwards. Rowland was working at Plas-y-Brenin and started to make increasingly frequent trips to the Ormes in 1969. 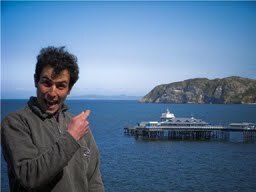 After climbing his first new route Gillies Groove on the Allotment on the Little Orme, Rowland embarked on a campaign of new routing and exploration in the area. As well as adding many free routes, Rowland established some long hard aid lines which would eventually significant free routes. 1970 saw him establish the line of Detritus on the Little Orme. This featured 200 metres of difficult climbing and took many years before it saw a free ascent from John Dunne. In 1972 Rowland also spent 16 hours establishing Wall of the Evening Light which would also gain classic status as a free route at 7b+. The best discovery during this period however was undoubtedly the magnificent Catell-y-Gwynt. This big imposing sheet of white limestone beneath the lighthouse on the Great Orme provided early inspiration to Rowland and co. The first route forged up the crag was Central Pillar which wasn't freed until 1983. In 1975 Rowland established New Dimensions on the Gwynt which was to gain classic status on a national level. 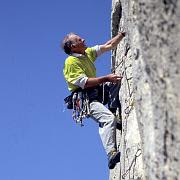 Jim Moran used chalk on the 3rd ascent which some believed invalidated his ascent! How times have changed! Rowland returned the following year to make the first free ascent at E4. In 1976 Rowland became the first person to produce a guidebook to the area. 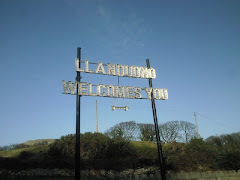 He had planned to do one earlier but was threatened with legal action by Mostyn Estates who have owned most of the land in Llandudno for 500 years. This highlighted the fact that climbing on many of the crags in the area was still a contentious issue and significant access negotiations would be needed in the years to come. In the late 70s Rowland scaled down his activities in the area and after graduating as a teacher he moved to Cornwall to open a rock climbing school. Rowland eventually established his climbing school on the Costa Blanca where he is now based. His thirst for new routes hasn't subsided and with his son Mark he developed many new climbs in the area. Rowland kickstarted the new routing on the Ormes and showed the way to the locals who would eventually continue his good work.